Chewing releases, feel-good chemicals from the brain and keeps dogs happy, busy and using up energy. 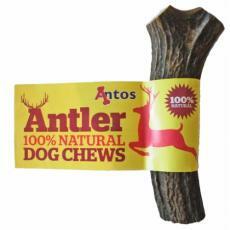 Antlers last longer than any other dog chew on the market – longer than rawhide chews or compacted vegetable starch chews. They wear down slowly with the grinding action of the dog’s teeth and saliva, into tasty morsels. Eventually, the dry marrow is exposed as a lovely treat when the outside has been worn away. They are suitable for puppies who are teething. The raw material used to make Antlers is sourced from naturally shed deer antler. Because it is a natural product and impossible to achieve uniformity in each size category, there are many occasions that a medium will look longer (and thinner) than a large which might be fatter and shorter. However, it is the weight that decides the category, not the length or girth. Product images demonstrate the natural variations in size within each size category. Just like with any chew, buying the right size for your dog is important. For example, whilst a toy dog could take on an extra large Stagbar, it would serve no benefit at all and would be quite overwhelming for the dog. Likewise, a giant breed should not be given a small Stagbar. So here is a guide to buying the right size. In the very unlikely event that your dog isn't interested in chewing the Antler, try rubbing it with sandpaper or a nail file. If your dog still isn't interested in it, try smearing on a small amount of peanut butter or honey, or soaking it overnight in water in the refrigerator. Remember, Antlers are incredibly long-lasting so you may find your dog leaves and goes back to the antler chew many times before it’s finished.